The Wisconsin Badgers knew they would be playing for the Big Ten Championship before they took the field against the Minnesota Gophers on Saturday. The first half may have looked like that as the Badgers trailed 17-7 at halftime. But the Wisconsin defense, which has engulfed opponents all season long, did it again in the second half against the Gophers. The Badgers rallied for a 31-17 win over the Gophers. The Badgers (10-2, 7-2 Big Ten) knocked off Minnesota (8-5, 5-4) for the 13th straight season, will now face Penn State in the Big Ten Championship game on Saturday night at Lucas Oil Stadium in Indianapolis. Penn State (10-2, 8-1) beat Michigan State, 45-12, on Saturday. 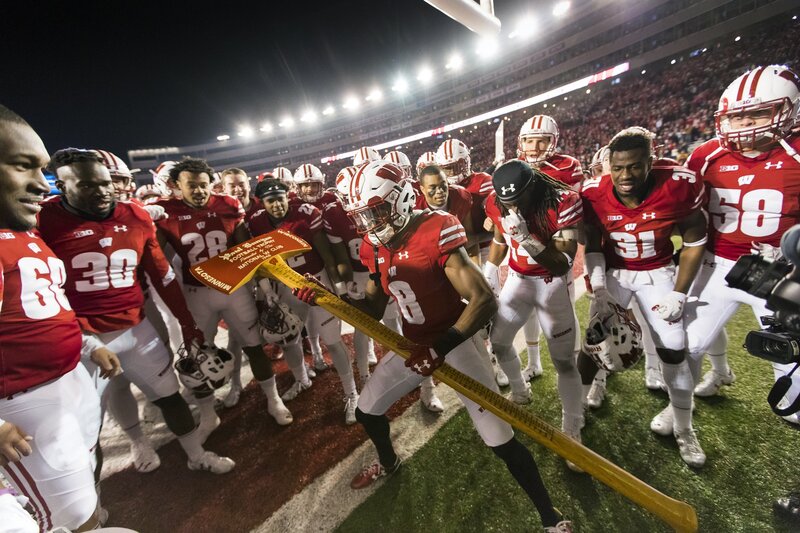 With Paul Bunyan’s Axe on the line today, Wisconsin tailback Corey Clement, who was issued two citations for disorderly conduct earlier this week, didn’t travel to Minneapolis for today’s Big Ten Conference finale between the Badgers and Minnesota Golden Gophers at TCF Bank Stadium. 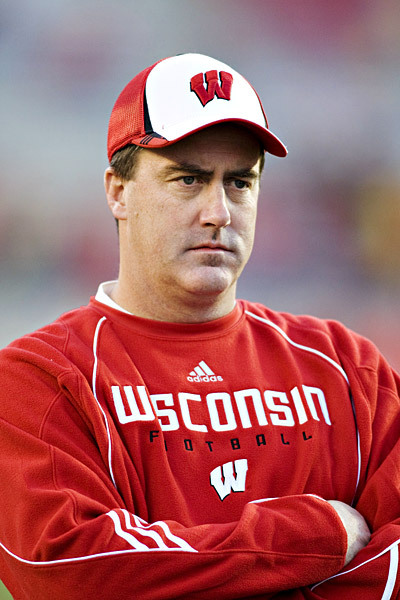 The decision to hold Clement out was made by coach Paul Chryst. It means the Badgers will again go with Dare Ogunbowale, Taiwan Deal and Alec Ingold against the Gophers. 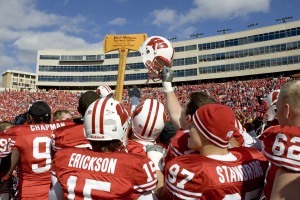 The Wisconsin Badgers currently have possession of Paul Bunyan’s Axe. If the Minnesota Gophers can pull off the upset over the Badgers on Saturday, they won’t have the chance to sprint across the field to the Badger sideline to take back the Axe. The two schools decided to change policy after an incident in Minneapolis last season almost led to a brawl. Minnesota players circled the goal post near their student section in an attempt to block the Wisconsin players from using the axe to hack away at the goal post, which is part of the tradition. That’s when things got ugly. Wisconsin coach Gary Andersen approached the UW administration about a change. Athletic Director Barry Alvarez approved that change. 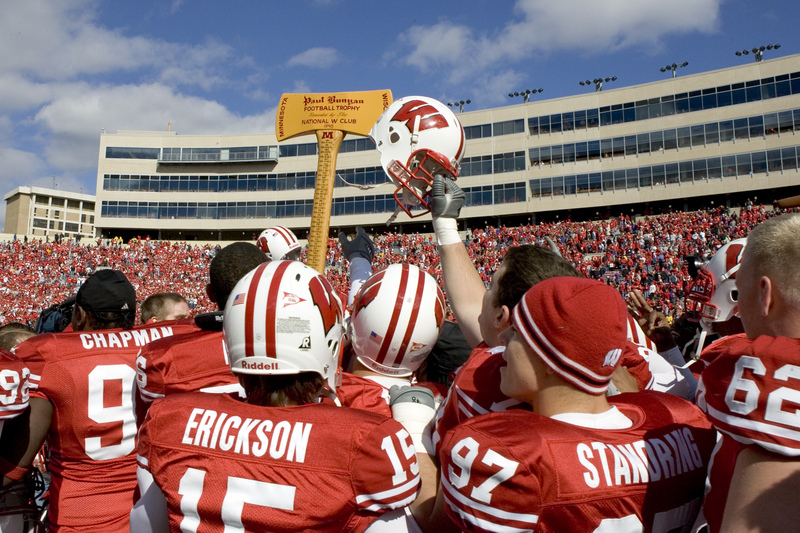 Now, the Axe will be on the field for the pregame coin toss, then taken inside the stadium. It will be handed over to the winning team after the game and the players can then come back out onto the field after the game to celebrate with their fans. Also at stake in Saturday’s game is the Big Ten Conference West Division title and a trip to the Big Ten Championship game. It’s a winner-take-all scenario for both teams, who are tied atop the Big Ten’s West division entering play. So much for the vaunted Indiana offense giving the 17th ranked Badger defense a run for their money. On a rainy, foggy day in Madison, the Badgers rolled to a 51-3 win over the Hoosiers, before 77,849 at Camp Randall. Wisconsin improved to 8-2 overall and 5-1 in the Big Ten, while the Hoosiers fell to 4-6 and 2-4.In his pregame speech, Wisconsin coach Gary Anderson asked his players to “start fast and stay steady”. A 93-yard touchdown run by James White on Wisconsin’s first offensive play took care of the fast start and a steady display of offensive and defensive dominance took care of the steady part. A year ago, the Badgers rushed for a school record 564 yards in a 62-14 win over the Hoosiers in Bloomington. They almost beat that total on Saturday, rushing for 554 yards on 50 carries (11.1 ypc avg.). Wisconsin finished with 676 yards of offense, the second-highest total in school history. The Badgers have had 600 yard days in three of the last six meetings with the Hoosiers. Wisconsin’s school record of 705 yards came against Indiana in 1999. James White rushed for a career high 205 yards on 20 carries. Melvin Gordon added 146 yards on 13 carries for the Badgers. in the Big Ten and UW record book for career touchdowns. With 72 in his three-plus seasons with the Badgers, Ball now has his sights set on the NCAA record of 78 held by Travis Prentice (Miami, OH). 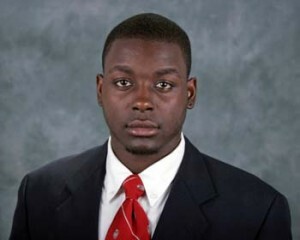 Ball rushed for 247 yards on 29 carries and scored three touchdowns. The highlight touchdown went for 67 yards on the second play of the third quarter, the longest of Ball’s career. For his effort, Ball was rewarded with his fifth career Big Ten Conference Offensive Player of the Week award. That is the second-most in school history, trailing only Dayne (9), and tied for seventh-most in conference history. In three conference games, Ball is averaging 152.0 yards per game and has scored eight touchdowns. The Badgers next host Minnesota in the Battle for Paul Bunyan’s Axe. The two teams square off at Camp Randall Stadium at 11am.